The Peterbald, a breed which includes hairless and nearly hairless cats, was developed through cross-breeding Don Sphynxes with Siamese and Oriental Shorthair cats. Peterbalds are svelte and graceful, with slender legs and tails, long graceful necks, elongated bodies, and rippling musculature. They have almond-shaped eyes and large, bat-like ears set relatively low on their triangular heads. The Peterbald coat may be a combination of two types, and furred Peterbalds come in many different colours and patterns. Interestingly, some Peterbalds change their colours and patterns over time. In 1986, Elena Kovaleva rescued a female tortoiseshell kitten from some boys who were throwing her around inside a bag. Elena adopted the kitten and named her Varvara. When Varvara began losing her fur at 4 months, Elena thought she was ill and brought her to a veterinarian. After attempting to treat what they thought was an infection, they determined that the otherwise healthy kitten was becoming hairless for natural reasons. 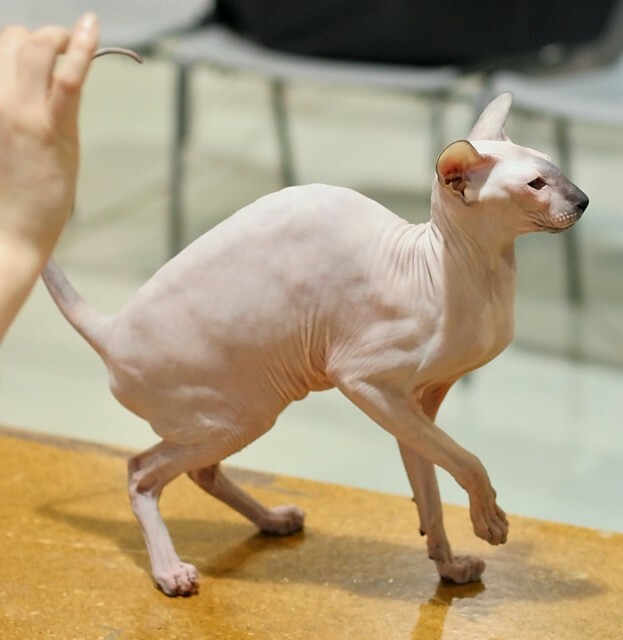 When Varvara produced litters of bald or balding kittens and kittens, it became obvious that the trait was genetic and that Varvara was not simply a Sphynx. The Sphynx hairless gene is recessive, meaning that a Sphynx mated with a furred cat produces furry kittens. In Varvara, the hairless gene was dominant, so when she mated with a furry cat, the kittens were bald or nearly bald. 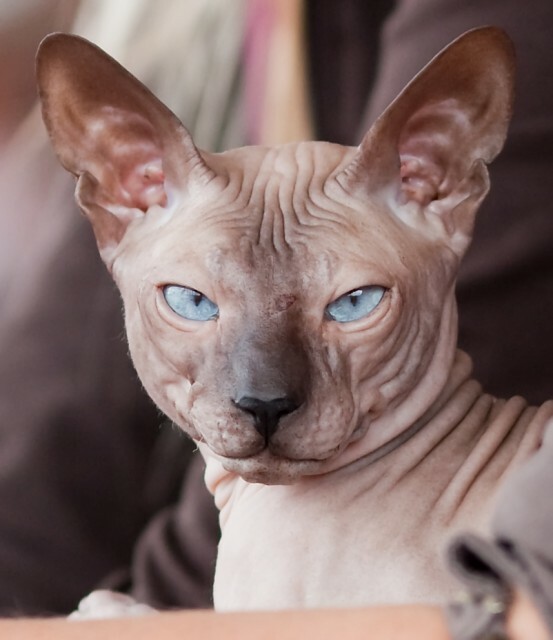 Varvara and her descendants became the Don Sphynx breed (also known as Don Hairless, Donskoy, or Donsky), and the Peterbald was developed by crossing Don Sphynxes with Oriental Shorthairs and Siamese cats. The breed’s name derives from its popularity in St. Petersburg. The International Cat Association (TICA), the World Cat Federation (WCF), and the American Cat Fanciers Association (AFCA) have all accepted the Peterbald breed for Championship Status. Like its Siamese and Oriental Shorthair relatives, the Peterbald is highly intelligent and very active. Most Peterbalds are sociable, affectionate, devoted to their owners, and friendly with new people. These cats are not usually cool or aloof. Rather, they tend to be lap cats, and also like to follow people around. They can be chatty, but their voices tend to be softer than those of their Siamese cousins. Peterbalds are good family cats, getting along well with most children, dogs, and other pets. They do best in households where there is someone home much of the time, as they need frequent interaction. Hairless cats require baths every 2-8 weeks to remove dirt and grease from their skin (completely hairless Peterbalds require more frequent bathing than furred Peterbalds). They may also require removal of earwax and oily buildup around the nail beds from time to time. Many people assume that hairless or nearly hairless cats are less likely to provoke allergic reactions than furry cats. While it’s true that some allergy sufferers are better able to tolerate breeds such as the Peterbald and the Sphynx, others find that they react just as intensely to nearly hairless and bald cats. The only way to know for sure is to spend time with the cat to be adopted beforehand. Peterbalds, lacking the protection of thick fur, are prone to sunburn and should be kept away from direct sunlight. Other than this, no specific health issues have been associated with the breed. However, this breed is relatively new, so it’s possible that there are heritable problems that have not yet been identified. Requesting a written health guarantee from the breeder is recommended. Prices for bald, flock, and velour Peterbald kittens range from $1,000 to several thousand for show quality. Brush-coated usually go for $800-$1,200 and traight-coated for approximately $300-$400, with prices varying greatly from one breeder to the next. Peterbalds kittens and cats may be found through the Fanciers Peterbald Breeder Listings. P&G Pet Care, IAMS Breed Guide. (2010). “Peterbald.” IAMS.com. Shamira Cattery. (2010). “History of the Peterbald Cat” and “Frequently Asked Questions.” “SmoothCats.com. TICA. (n.d.). “The History of the Peterbald” and “Types of Peterbald Hair.” PeterbaldCats.net.